This summer has been a hot one! With so much sweat and stickiness, baking (and cooking) seems like an overwhelming feat. Since my last post, I’ve been mulling over what my first recipe post was going to be. I obviously wanted to start out with something sweet but this heat was discouraging me. Determined to share something with you guys, I finally decided on what I wanted to make. My sister and I started our weekly pilgrimage to the greenmarket in our neighborhood every Thursday a couple of weeks ago. New York City hosts greenmarkets all over the city during the summer months that end right before Thanksgiving. I look forward to the arrival of our local greenmarket every summer; located about 10 city blocks from our apartment building. We trek out every Thursday, sometimes in the sweltering heat, and are instantly greeted with an abundance of fresh fruits, vegetables, flowers, baked goods, and people. We usually stock up on fresh goodies like kale, cherries, corn and zucchini. Fresh strawberries and a small peek at tiny broccoli florets! I didn’t really eat vegetables until a couple years ago. Now, I know what you’re thinking; how can you not have eaten vegetables?! Well, I grew up on a pretty limited diet that excluded anything green (unless it was ketchup). I was a very picky eater and mostly stuck to white rice, chicken breast, and bananas. This limited diet obviously wasn’t doing me any favors, and coupled with inactivity, lead to weight gain. It wasn’t until I committed to losing weight and eating healthy a few years ago, that I branched out to include vegetables as part of my daily diet. One of the first vegetables I tried was zucchini. The varieties of summer squash intrigued me, leading me to choose the popular and green zucchini. Careful that I did not end up buying cucumbers, I set out to try to cook and eat them. I actually loved them! I’d bake them, saute them, make fries out of them, throw them in lasagna; the options were endless. Its mild taste and soft nature when cooked fascinated me. It wasn’t until recently that I welcomed the idea of baking it in a cake. Well, bread but you get the idea. I was scrolling through my Twitter feed last night and stumbled across Food52’s post on zucchini bread. Food 52 is a great resource for recipes and if you haven’t checked them out, you should! I checked out the recipe and immediately got excited when I realized I had all of the ingredients. Normally, I’d be wary of testing a recipe like this but I can’t help but want to try it. Sift the dry ingredients together! Batter is ready for the pan! This was my first attempt at making a zucchini bread. I wasn’t wary because I have already had success with my signature carrot cake (a recipe I will share soon). It came out moist and ridiculously delicious. It was surprisingly popular with my picky father and is all gone already! Please visit the Food52 website (and the original blogger’s page) for the beautiful story that accompanies this recipe! Preheat oven to 350˚F. Grease two 5×9-inch loaf pans and set aside. In a medium bowl, sift together flour, cinnamon, nutmeg, salt, baking soda and baking powder. In a large bowl mix eggs, oil, sugar and vanilla. Stir in the grated zucchini. Stir the dry ingredients into the wet and stir just until the flour is incorporated. Stir in the walnuts and dried fruit if using. Pour equal parts of the batter into each loaf pan. Bake for 45-50 minutes, or until a toothpick inserted in the center comes out clean. Let cool on wire rack, then slice and serve. I used my large loaf pan to make this recipe without any scaling. The original recipe is for two small loaves, which happily fit into my pan. I also used only raisins, instead of the dried cranberries and walnuts. I must admit, it’d be fabulous with walnuts. 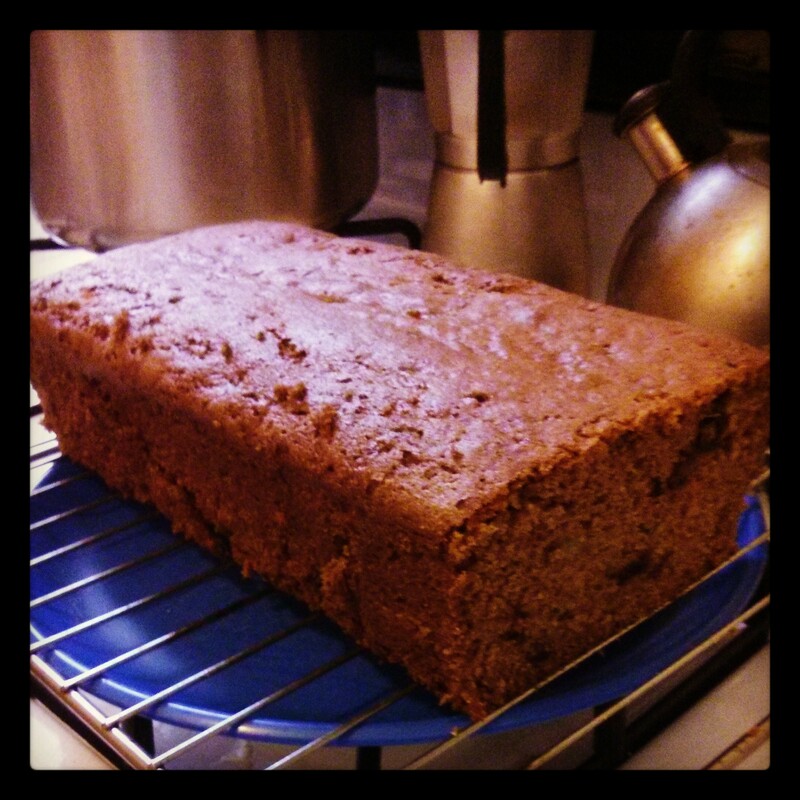 I added the raisins to my dry ingredients, so they wouldn’t all sink to the bottom of the loaf. I baked this in my toaster oven at 350F, on the bake setting for about 50 minutes. I turned up the temp to 400F and baked it for 5-10 minutes more because it was still undercooked in the middle. If baking in a toaster oven, please watch the cake! Make sure it is baked all the way through and watch out for dry spots.